With Mother’s Day just around the corner, I wanted to create a special dessert that would be perfect to honor Moms. I made a Pink Ombre Swirl Cake last summer, and have been wanting to make another pretty ombre (layered color) cake ever since. This time, instead of one large cake, I made several mini cakes. I also left the outside unfrosted, to reveal the pretty layered colors of the cake itself. Purple is often a color I think of for Moms, and it’s one of my favorites as well. This general ombre (layered color) concept could be done lots of different ways, and with most any color scheme. 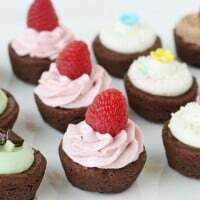 I’ll lay out the steps I used to make these mini cakes, but feel free to adjust the process for different sized cakes, or according to your ideas and preferences. 1. Prepare vanilla cake batter, using a box mix or a scratch recipe. My notes ~ I have a great go-to vanilla cake/cupcake recipe, but this time I used a box mix (Betty Crocker French Vanilla). I mixed up TWO box mixes, and then had enough batter left over for 12 cupcakes. 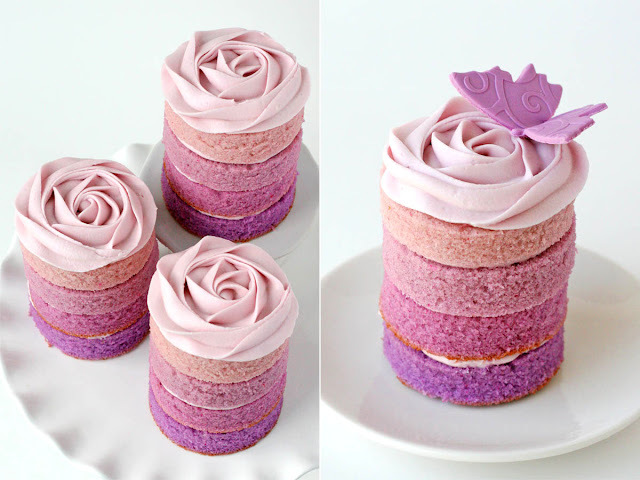 Depending on the size pans you use for the purple layers, you could probably accomplish this with only one box mix (or batter that makes about 24+ cupcakes). My notes ~ If you have 4 of the same sized round baking pans, then each bowl of colored batter should have equal amounts in it. I don’t have 4 of the same size, so I used 2-8″ pans and 2-9″ pans. Because of this, I put 1 cup of batter in two bowls, and 1.5 cups of batter in two bowls, colored it as desired, then poured the smaller (1 cup amount) of batter into the 8″ pans, and the 1.5 cups of batter into each 9″ pan. For the colors shown, I used Americolor Regal Purple and Electric Purple. I added one full drop of each color in the darkest batter, and used less than a drop (a small amount on a toothpick) for the other layers. 3. Pour batter into prepared baking pans (pans should be oiled, floured, and lined on the bottom with parchment paper). 4. Bake as directed by recipe. Cool cakes on cooling rack. Remove cake from pans, and move to a cutting surface. Level the cakes (cut off the top dome), as needed. 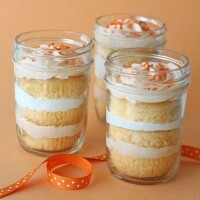 My notes ~ I used a 2 3/4″ cookie cutter and I was able to make 4 mini layer cakes (as shown), with cake scraps left over. I think if you used a 2 1/2″ cutter, and baked all your batter in 9″ (round) cake pans, you would be able to make 5 mini layer cakes. My notes ~ I prepared a batch of my favorite Vanilla Cream Cheese Frosting (you could use simple American Buttercream if you prefer). I piped a layer of frosting (between the cake layers) using a medium sized round tip (a Wilton #12). I finished the cakes with a rosette of frosting, using a 1M tip, frosting from the center of the “rose”, spiraling toward the outside. 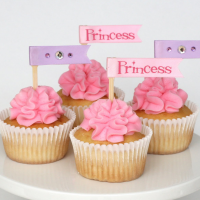 I have a video showing how to frost cupcakes in this way, in my post on How to Frost Cupcakes. 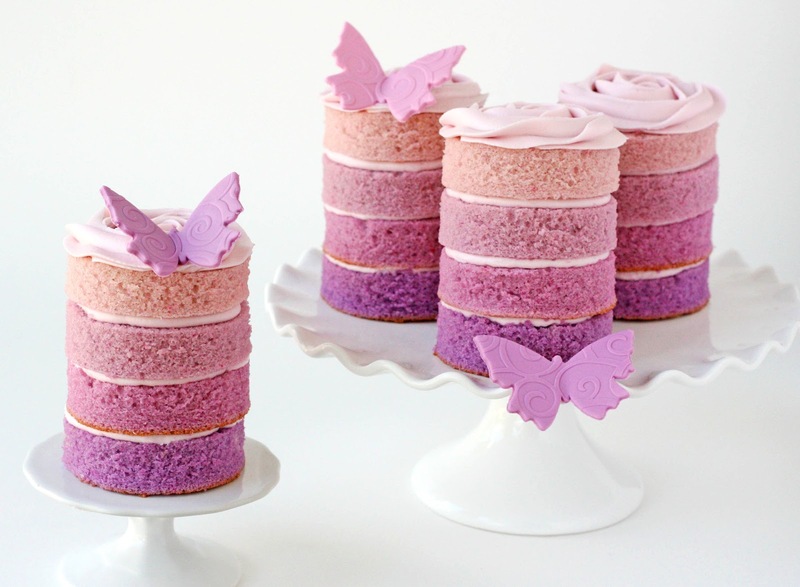 I finished the mini cakes with a fondant butterfly. I will share a post on how I made the butterflies later this week. Looking for more pretty Mother’s Day ideas? 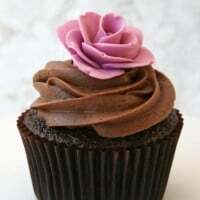 My Hydrangea Cupcakes are a beautiful, and surprisingly simple way to make a statement. 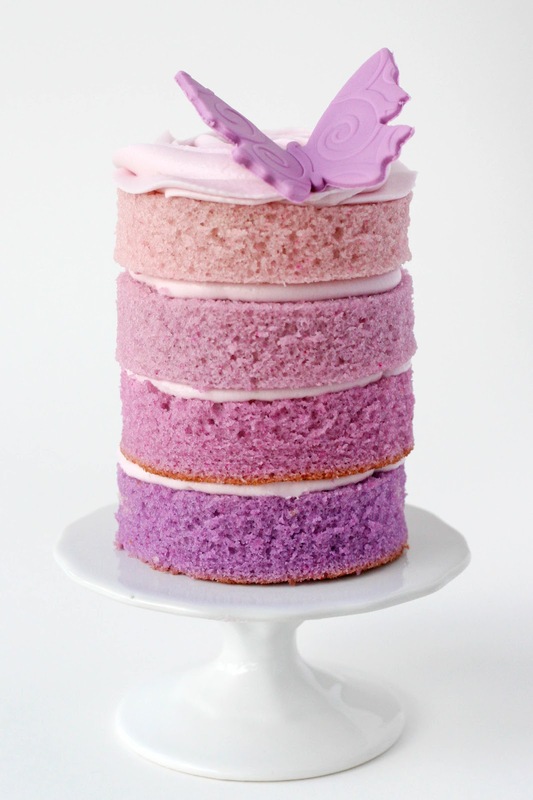 Or my original, Pink Ombre Swirl Cake could be a gorgeous gift (to share). 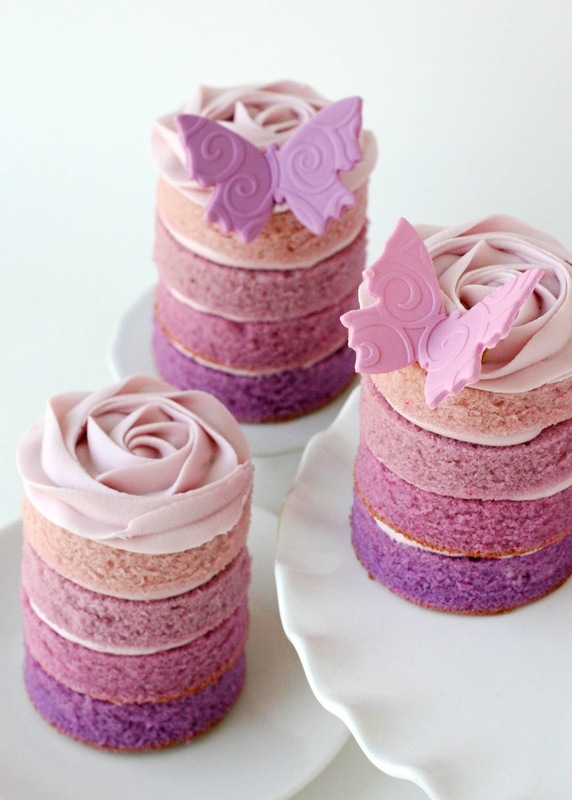 Want to make the pretty fondant butterfly accents? I’ve posted a full tutorial on How to Make Fondant Butterflies. Sorry I see you posted the colors and brand. How far in advance do you make and how do you store them so they don’t dry out? Wow, these are such gorgeous mini cakes! I love the colors! Hi! 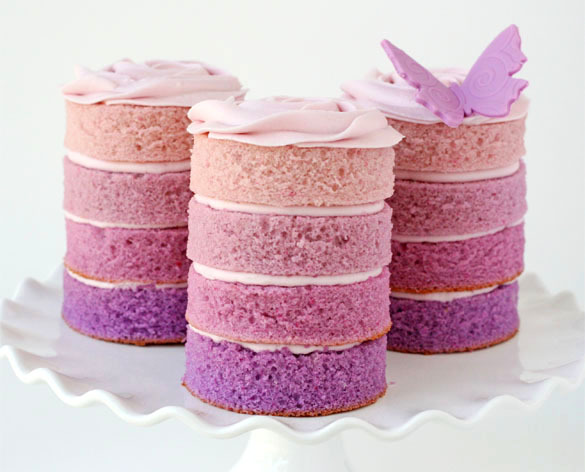 These mini cakes are adorable! I’m going to be making similar mini cakes for my sister-in-law’s wedding. Do you have any tips on how to keep them from drying out? Thanks!